Amazon.com converted its free Kindle app for iPhone (which Macworld gave a rating) into a universal app with the launch of the iPad. I’m a big fan of my Kindle 2 e-reader, but I thought the iPhone version was merely passable; the reading experience on the iPhone’s tiny screen is just a bit too cramped for my taste. The iPad-optimized version of the Kindle app, however, makes great use of the larger screen area—and truly makes the iPad an excellent e-reader. 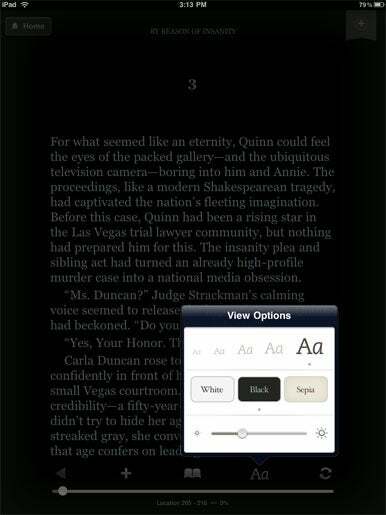 Screen Space: Kindle is now a hybrid app that runs on both the iPhone and the iPad. The version of the e-reader optimized for the iPad makes great use of that device’s larger screen area. Once you’re ready to curl up and read, the Kindle app really shines. The app’s main reading view is entirely unadorned; it’s literally just words, words, words. You turn pages with a short swipe, or a tap on the edge of the screen. If you tap elsewhere on the page, the app’s other interface options appear. You can add bookmarks, navigate to a specific location or the table of contents, or adjust the display. Those display options are important. You can choose from five different font-sizes (I prefer the largest) and three different coloration options. You can choose to read with black text on a white background, white text on a background, or dark text on a sepia background. A brightness slider lets you further adjust how things look. By day, I prefer to read in the sepia mode, at about 75 percent brightness. When I’m reading in bed, though, I prefer the white-on-black view, with the brightness dialed way down. The text still has plenty of contrast to remain crisply readable, I don’t need a book light, and I don’t have to worry about the normally very bright backlit screen literally keeping me awake at night. These seemingly simple controls actually make a significant impact on the Kindle app’s “reading pleasure” quotient. Optimize Your Options: You can choose from five different font sizes and three different coloration options, including white-on-black for optimal night-time viewing with Kindle on the iPad. The app doesn’t get everything right on the display front, unfortunately. Unlike iBooks, you can’t control the font itself—that’s set by Amazon the publisher. The text color in sepia mode could benefit from being a smidge darker, and that’s similarly nonadjustable. Most annoying, though, is that the panel for adjusting the app’s color scheme doesn’t reflect your chosen color scheme. That is, I’m doing nighttime reading with white text on a black background, and I decide to make the text a bit darker, the panel appears with a painfully bright, retina-searing white background. 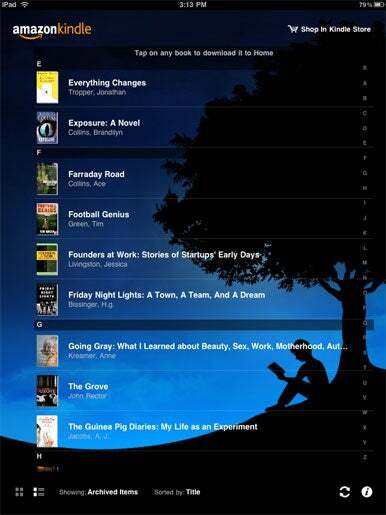 Kindle for iPad supports landscape mode, but you won’t want to use it. The single-column of text that it employs is just too wide to read comfortably. The iPad app supports what Amazon calls “WhisperSync,” which essentially means that it always knows what page you’re on. If you read a couple pages on your iPhone (or hardware Kindle) while you’re waiting for the barista to finish your order, the iPad app will automatically take note (if you’re online) and put you on the proper page. Other unique Amazon features supported include the ability to add notes and highlights to the text, both of which work fine. Disappointingly, while Kindle devices (and iBooks) let you look up words as you read, the Kindle app omits that feature. My few niggles aside, Kindle for iPad excels because of its visual customizability, and its overall simplicity. You can tweak the screen to your liking, and then simply read. I use the app every single day, while my Kindle 2 sits sullenly, untouched on my nightstand.